For some reason, when I edited my blog this review disappeared. Can’t have that, since it’s my favourite book EVER. And I mean EVER EVER EVER, out of ALL THE BOOKS. EVER. So, I’ve written this new review. Which is actually borderline incoherent gushing about witches and Scotland and all of the awesomeness that this book has. On the surface, Witch Light appears to be a historical novel. It takes place in Scotland in 1692, in the aftermath of the Glencoe Massacre. So it is based on real events, and most of the people in it are people who really lived. In a prison cell in Inverary, a young girl named Corrag is being held for witchcraft. But that’s not all — she was also a witness to the massacre, and had her part to play in the gruesome event. Charles Leslie, an Irishman trying to uncover the truth behind the massacre, visits Corrag to interview her. She agrees to tell him what happened on the night of the massacre, but only if he will listen to the rest of her life story first. Leslie reluctantly agrees. What follows is a story so wise, humble, and heartbreaking that it obliterates any preconceptions you may have when you initially pick up this book. Also, just a note before I continue: Witch Light has also been published under the titles Corrag and The Highland Witch. So if you see them all, don’t get confused. They are the same book. I’ve always been drawn to stories about witches (maybe because I’m certain that I would have been burnt as one back in the day…) I picked this up and thought ‘ah, witches. Magic, then. Some history, cool.’ Two chapters in and I knew I’d gotten way more than I bargained for. This is more than a story about the massacre, or about witchcraft. It’s the story of a girl, who loves and learns and follows her heart. The prose style is bold and charming — okay, a little heavy going at first until the novel settles in to Corrag’s life story, but once it gets there then it takes off and that’s that. The Glencoe Massacre Monument. Image my own. The novel is narrated alternately by Corrag and Leslie, through letters he writes to his wife back in Ireland. This works well, because it offers two sides and in particular, two impressions of the label ‘witch.’ Obviously ‘witch’ was a dangerous thing to be called in the 1600s. As a religious man, initially Leslie is all for burning Corrag at the stake. But as he discovers more about her, his opinion begins to change. He comes to realise that Corrag is a human, and that ‘witch’ does not take that away from her. From Corrag’s point of view, we hear about the prejudice she and her mother face. Judgment is thick is this novel, with undesirable words like ‘whore’ and ‘hag’ following closely behind ‘witch.’ I think this an important aspect, as it implicates society for branding people unfairly. Because Corrag is seen to fit the criteria for being a witch, therefore she is also a whore and a hag because that’s just how witches are thought to be. But, reading her story, we can clearly see that she is neither. Corrag’s narrative voice makes it very easy to identify with her. I don’t think I have ever connected with a main protagonist as much as I did with her. Her outlook is simple and optimistic, and she values little things like the wind blowing off the sea and how a wolf sounds when it calls. She also has feelings which are easy to relate to — loneliness, fear of pain, longing, and affection. Once in Glencoe, she gives the mountains her own nicknames which really brings the place alive. Regarding setting, I have to say that it’s pretty spectacular. I mean, come on. A place which looks like this is just BEGGING for a story. In fact, once I finished this book I lent it to my mum. Once she had finished it, she came rushing into my room and we shared this look that said ‘damn, now we have to go to Scotland!’ Proof of this book’s power right there — if makes you enthusiastic about a 10 hour car journey then it must be good. And we actually did go! Dad found a little cottage in Glencoe to rent for a week, and when we got there we mentioned Witch Light to the owner. She smiled and nodded enthusiastically, and then told us that Susan Fletcher had rented the same cottage and lived in it whilst writing the novel. Cue the biggest fangirl freak-out of my life! This is the cottage – the little bit of the house on the right. It had a log fire, deer came into the garden, and we got to look out of the window and see the mist on the mountains every day! Image my own. Overall, I was pretty impressed with this book. Okay, that’s putting it mildly. I fell completely, totally, and irrevocably in love with it. I’m ending my review here because I can’t think of coherent words to explain how amazing it is. Just please, go and find out for yourselves. I think that everyone can get something out of this story. If you like historical fiction, you should read this. 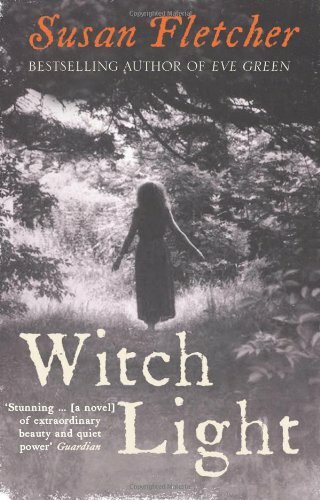 If you like witches, you should read this. If you like words and paper in general, you should read this. You get the picture. Witch Light defies all genres and definition. Corrag’s words will stay with you long after you’ve read the last page and nestled the book onto your shelf. For more information about Susan Fletcher, Witch Light, and her other books, you can follow her on Twitter @sfletcherauthor. Also, I’m curious! I’ve said this is my favourite book, and it is (along with a couple of others which destroyed me around the same amount) If you had to pick just one or two books to be your favourite, could you do it? Why would you choose them?